Candidates for the 2nd degree ceremony should arrive at 8:30 a.m. and should appear in coat and tie with current membership card. The 2nd degree ceremony will start at 9 a.m. and will last approximately one hour each with a coffee & donut reception following. Candidates for the 3rd degree ceremony should arrive at 10:15 a.m. and should appear in coat and tie with current membership card. The 3rd degree ceremony will start at 11 a.m. and should last approximately one ½ hours with a lunch reception following the 3rd degree ceremony. The Fr. Herbert Hall anti-chamber room is located at the rear of the school, look for the Knights of Columbus Council entry door. Please inform our Council Chancellor & Advancement Chairman Ron Coombs, before Sunday May 29th that you are a 2nd or 3rd degree ready to advance candidate and you will attend this ceremony. Also, any Knights who have attained the 2nd or 3rd Degree are encouraged to attend and support our brothers as they advance. Brother Knights: we once again have the privilege to help with the Special Olympics Summer Games that will be held at the University of Richmond Robbins Center and Stadium on Friday June 10 and on Saturday June 11. On Friday evening we need volunteers to help the athletes and their families and caregivers get seated for the ceremonies and celebration. This year the event is going to be held in the stadium – weather permitting. If you want to be part of a really special event, let me know. On Friday you will need to be at the Stadium no later than 5:30 PM and you will help people and groups to get to their designated seats, and distribute lightsticks to the athletes. It is a lot of fun – lots of smiles and lots of excited athletes. Once the ceremonies begin, you are free to leave, although many of our Knights have chosen to stay and join in the celebration. 12 and for 12 to 4 PM. Lunch is available at the Hardee’s tent for volunteers. Send me an EM at andyj31524@gmail.com I will be glad to answer any questions you may have. If you have children or grandchildren that would like to volunteer with you, they can qualify for Community Service hours by helping out. Pictured are Knights Gary Gore, Randy Boyd, John Barias, Frank Russo, and Bike Drive Chairman Bob Redmond. 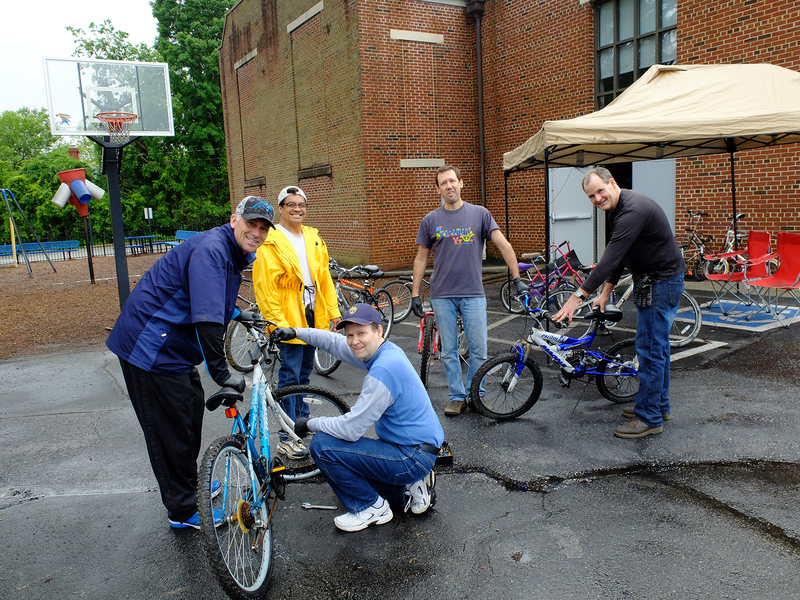 About a dozen Knights from St. Bridget Church Knights of Columbus, Council 5476, turned out in the rain on Saturday May 21st to collect and repair used bicycles that were donated from their parishioners. The effort is intended to support the Sacred Heart Catholic Church Parish during their annual Sacred Heart Festival in June. Coordinated by Brother Knight Bob Redmond, the St. Bridget’s Knights accepted 24 lovingly used bicycles, and refurbished all but four for auction. They ranged in size and style from children’s to adult bikes. The unused bikes were salvaged for spare parts, so almost nothing was wasted. Once in working order, the bikes were delivered to Sacred Heart Parish so that they may be auctioned off during their Patron Festival scheduled for June 3 and 4 (The Feast of the Sacred Heart). The parish’s annual Sacred Heart Festival is a celebration of authentic Latin culture, cuisine, and dancing and contests. Established in 1901, Sacred Heart Parish is the oldest Catholic Church Community in Manchester, which is located in South Richmond. It has been staffed by the Jesuits since 1990. The parish has become a hub for Latino immigrants and other Catholics who live in that area. Now the parish has seven Masses per weekend, with overflow crowds at 11 AM on Sunday. The parish also has a growing Knights of Columbus presence, which generously supports the parish and surrounding communities.